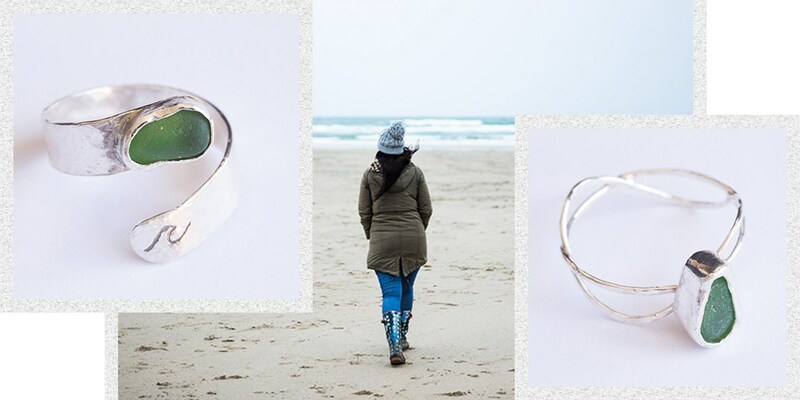 Cornwall is filled with inspiration - and amazing jewellers too! 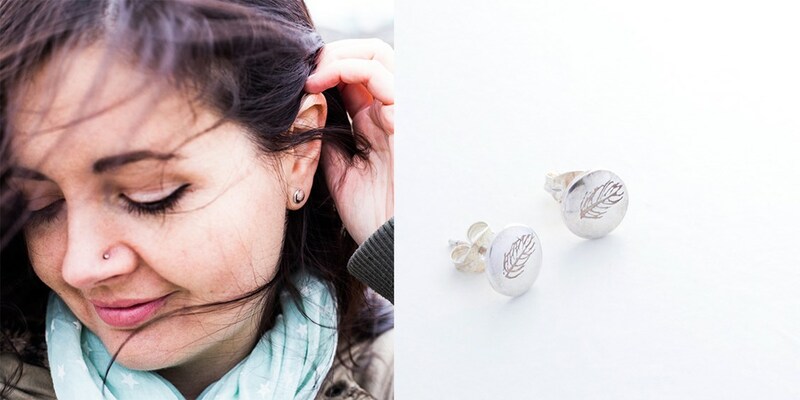 Today we chat to eco-friendly jeweller, Jemima Hurlock all about her beautiful nature inspired jewellery. It's great to see so many jewellers becoming more eco-aware, choosing materials that are better for the environment and being more mindful of the impact they may be creating. 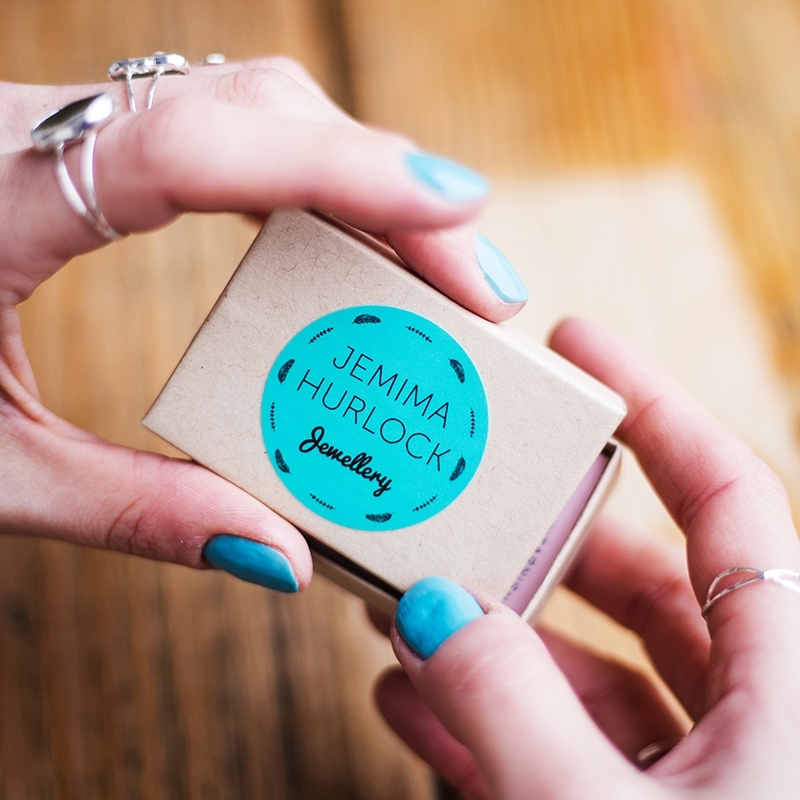 Jemima works full time but manages to fit in a wonderful handmade jewellery business in her spare time. 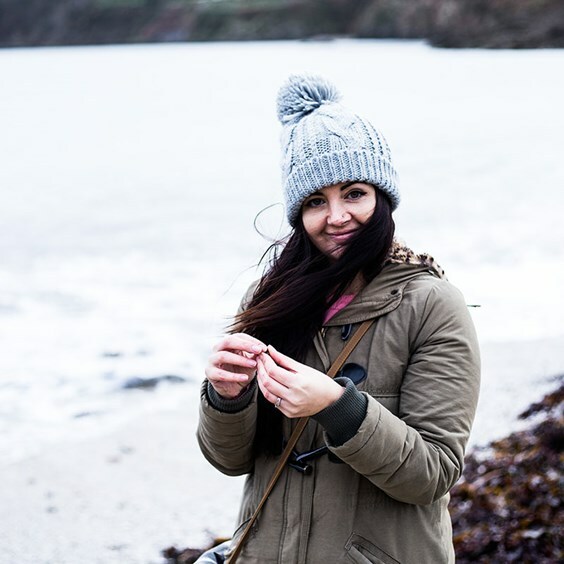 We absolutely love Jemima's sea glass jewellery - so we find out more about why she loves using this man made gem and her secret spots for finding the those special pieces. 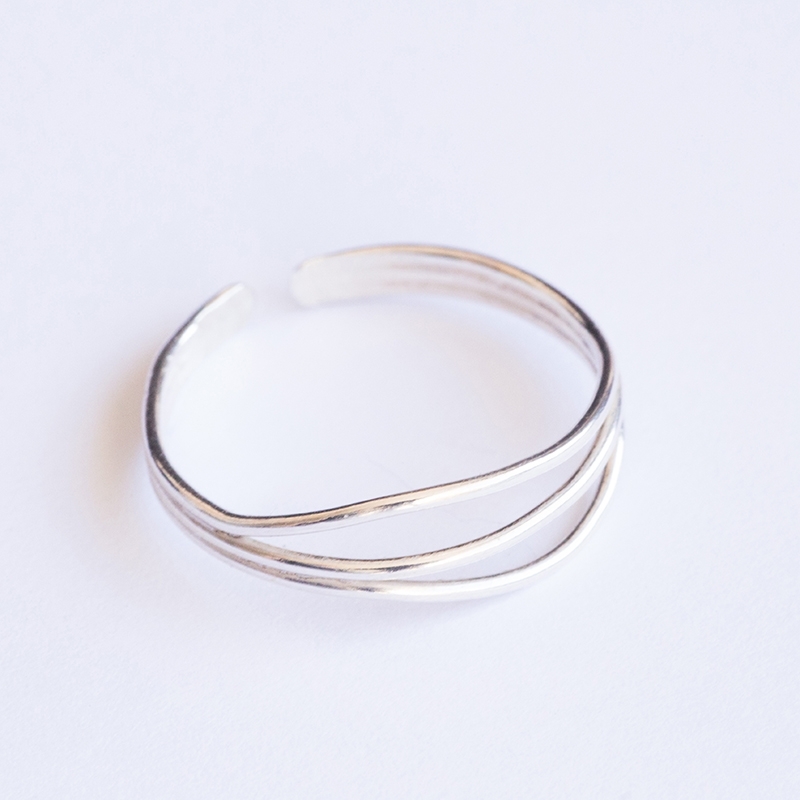 We also find out why she chooses to use eco-friendly metal, made from 100% recycled scrap silver. Packaging is also something Jemima focuses on, with no plastic in sight Jemima shares exactly what materials she uses to create environmentally friendly packaging. We find out the ways Jemima makes a difference in her day to day life as well as in the workshop - we hope it inspires you to make small changes too. I’ve always been a maker - when I was little I was collecting up toilet roll tubes and egg boxes for craft projects while my friends were playing with toys. I never really knew how to translate that into a career so while I enjoyed trying out lots of different crafts as I grew up, it wasn’t until I attended a Saturday jewellery workshop at Truro College that it clicked. 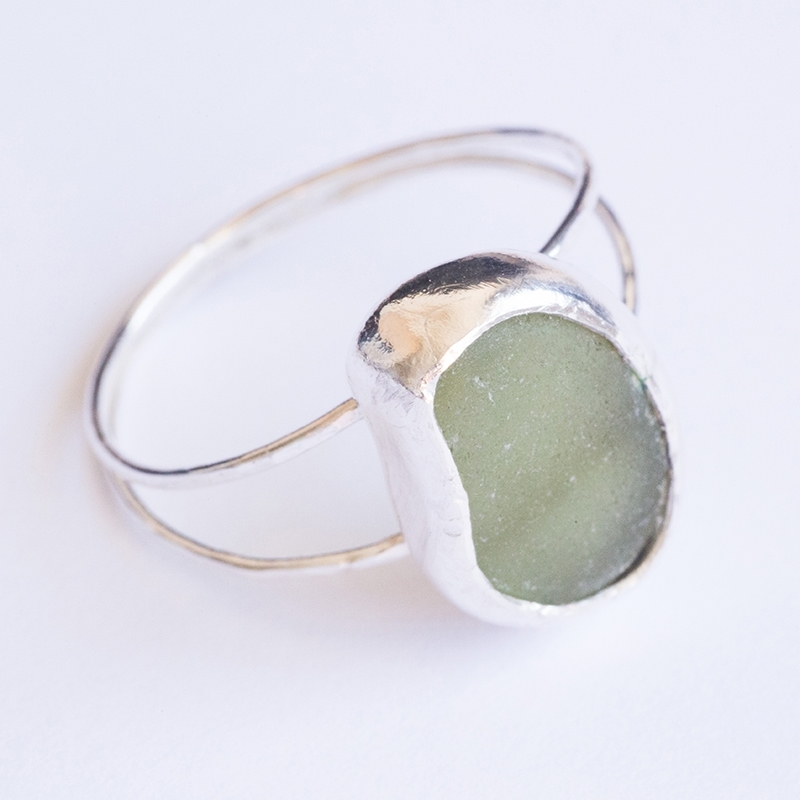 In that workshop I made my first ring, bangle and pair of earrings, and I fell in love with jewellery making. I had friends who always knew exactly what and who they wanted to be when they grew up and I always wondered how it must feel to be so sure of a path - it was an incredible feeling to finally get that realisation for myself. 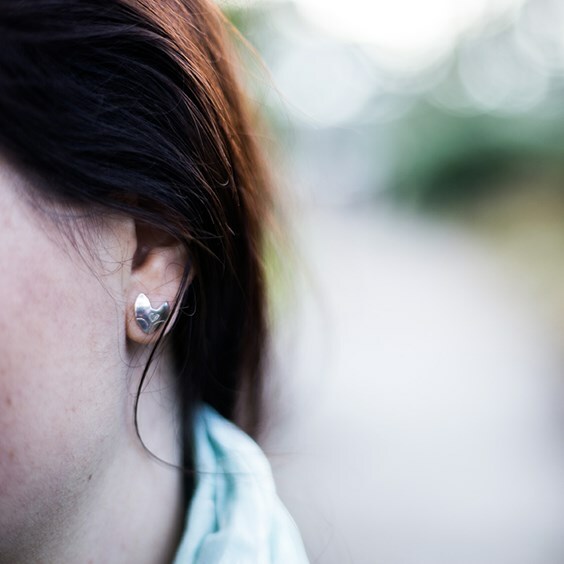 How important is creating ethical jewellery to you? I have a full-time day job working for a social enterprise which has really shaped the way that I think about doing business and being a consumer. There is a growing appetite for businesses that balance the need to generate a sustainable income with making ethical decisions about the way that they operate and I couldn’t imagine setting up a business any other way. 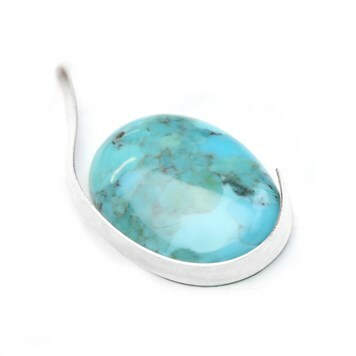 Where do you find inspiration for your jewellery designs? I’m at my most inspired when I’m outside, whether it’s a beautiful woodland walk with sun dappling through the trees or a wild and windy day on the beach getting lashed with the rain. We’re all familiar with the famously untranslatable Danish term ‘hygge’ and I recently discovered a similar Norwegian concept - ‘friluftsliv’ which describes that feeling when you are outside enjoying being immersed in nature. 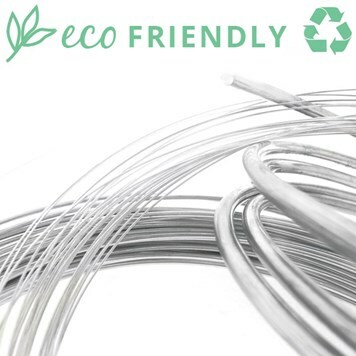 Why do you make the conscious choice to use eco-friendly metal in your designs? In the last few years there has been so much information about the impact of plastics in our seas, and it’s so encouraging to see the way that people have responded to that but I don’t think it needs to stop at plastic. ‘Stuff’ is in abundance - you only need to look in the charity shops and local household recycling centres to be overwhelmed by the scale at which we discard things. It made sense to me to be creative with what’s already out there rather than creating a demand for more new materials. What else do you do to be more environmentally friendly in the workshop and in general day-to-day life? In the workshop I try to do everything I can to be environmentally friendly, from the materials and packaging I use to changing electricity suppliers to ecotricity who offer 100% renewable energy, but the biggest change I made in my life was a couple of years ago when I gave up animal products in my diet. I was shocked to learn about the sustainability issues with meat consumption - it’s estimated that on average it takes four and half times the land to supply a meat diet compared with a plant based diet - cutting out meat, dairy and animal products can reduce your carbon footprint more than giving up your car (and getting around Cornwall without a car is really challenging). So while my main motivation for doing it was for the animals, it was great to know that it was making a positive difference in other ways as well. You work full time while also making jewellery, how do you stay organised? My full-time day job is Mon-Fri so that imposes a structure on my time – everything else has to fit around it either early in the morning, in the evenings or on weekends. It is tricky to keep all the plates spinning at once because of course I’d love to spend all my free time in the workshop but there are other parts of the business that need attention, such as marketing and social media, admin and finance, and then of course there’s life! I also need to eat and make some vague attempt to keep on top of the house and laundry from time to time, and it’s important to me to make time to get outside as much as I can – to collect sea glass, find inspiration and just breathe. I suppose what I’m saying is that it doesn’t feel like I am particularly organised but hopefully as my business grows I can afford to make some adjustments to get more of that balance to fit everything in. Cornwall is home, I was born here and have lived here all my life. While I can see the appeal of living abroad for sunnier (and drier!) weather, there’s nowhere else in the UK I could imagine being. I think it’s so easy to take life in Cornwall for granted. I travel around the whole of the south west and beyond for meetings quite often for my day job and there’s nowhere like this. When people ask where I’m from I’m so proud to say I’m Cornish! 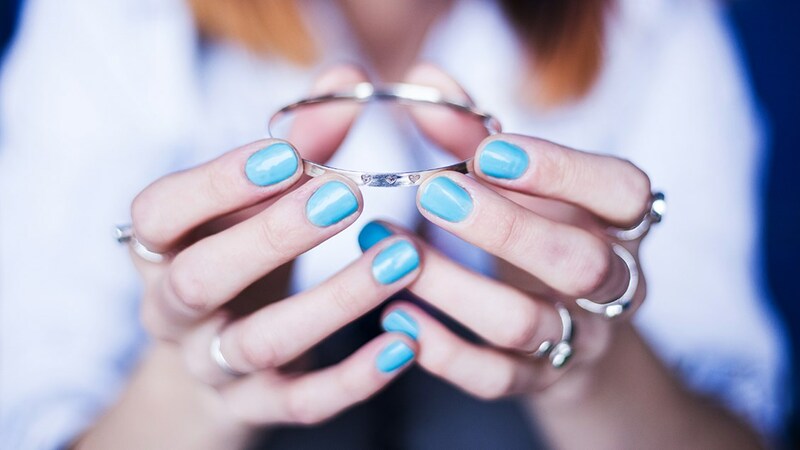 We love your sea glass designs! What do you like most about this man made gemstone? I love how unique every piece is, and that each one has its own story. The sea is so powerful, and these pieces of sea glass have spent years tumbling around in the waves before washing up on our beaches, there’s such mystery there! I think they also provide a lovely metaphor about the beauty in surviving through struggles over time, and coming out the other side just as strong but with gentler edges. 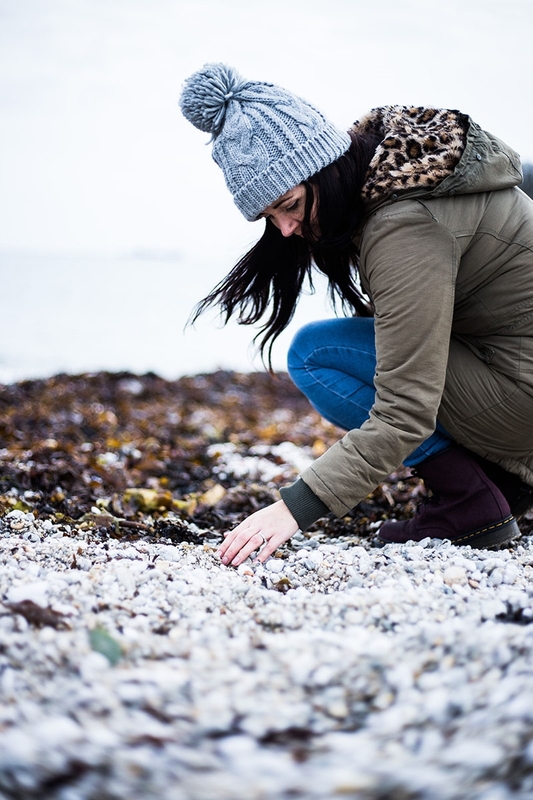 Favourite beach for finding sea glass? I’m still exploring to see where is best! I love Perranporth which is closest for me but it’s so big it takes quite a while to comb! I’ve been really successful at Swanpool, I’m not sure if that’s because the waves are gentler on the south coast or that it’s easier to spot the sea glass amongst the pebbles than it is in the sand. Wherever I go I always come away with wet feet though so I really need to work on my wave avoidance strategy! What advice would you give to jewellers wanting to make a difference to the environment but not sure where to start? Don’t try to change everything at once – just think about small steps you can take. It doesn’t make sense to throw out all your plastic packaging and replace it now (in fact that’s wasteful), but next time you need to make an order, see if you can make a more ethical choice. Also consider the distances that supplies need to travel to get to you – a local supplier may cost a little more because they are a smaller business themselves, but there is a global movement towards responsible consumerism so as long as you can demonstrate the positive impact behind the choices you’ve made, people are often happy to pay a little more to support that. 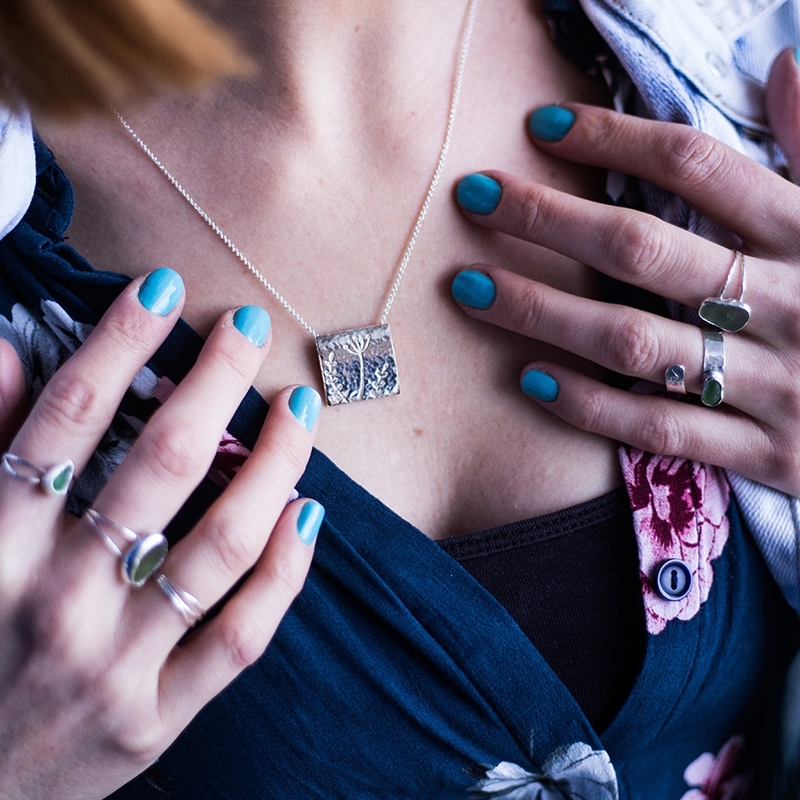 What’s your favourite piece of jewellery you have ever made and why? Working with sea glass has been my favourite because of the uniqueness behind every piece. With my other designs, I’ve come up with the ideas first, and then considered the right materials and techniques to bring them to life, whereas the sea glass flips that process around. 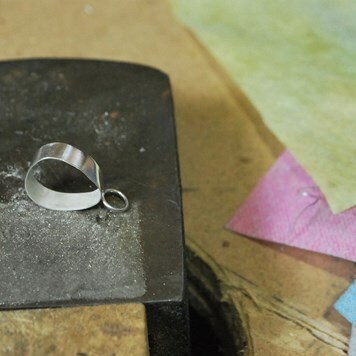 Each piece is it’s own special colour and shape that lends itself to a ring, a pendant or earrings, so I let that lead the design and experiment to see what comes up. Tell us about your environmentally friendly packaging! I’ve always hated when you order something small and it arrives in a massive box filled with polystyrene or plastic, so I was determined to be as sensible as possible for my jewellery. At the same time, as a consumer I’m a sucker for lovely packaging! I wanted my packaging to be beautiful and still have minimal environmental impact. I’ve chosen to use kraft boxes which I send out in small cardboard boxes. Instead of bubble wrap I use tissue paper to pad out the package and I’m also looking into a recyclable tape to seal that box closed. Because Silver easily tarnishes when it’s exposed to the air I pop an anti-tarnish strip into the box that absorbs pollutants in the air to preserve the sheen - I managed to source a cardboard version of these so that it can be recycled at the end of its life. What is your most popular product? Tell us the story behind it! I make earrings and a pendant featuring an etched feather which are very popular – as are the sea glass and wire rings. When I was coming up with my initial collection to launch I wanted to have a variety because I really wasn’t sure what people would like, so it’s great to be a few months in and to start seeing which are the most popular. The fox studs also get a lot of attention and I love making those so I’m now looking at bringing some other wildlife animals and insects into the collection. What’s your workshop soundtrack right now? I said I would never do it but I’ve become one of those people who are stuck in a moment when it comes to music – I’ve got a Spotify playlist that’s almost entirely made up of 90’s rock, grunge, Britpop and indie. I do love discovering new bands and hearing new music so I check out the discover playlists as well, but I’m a 90’s girl at heart. What area of jewellery making would you like to explore in the future? I’ve loved how introducing sea glass has brought colour into my work and would love to explore that further, with patinas and enamelling. I did a fair bit of experimenting with enamelling when I was at college but haven’t really picked it back up in my own workshop. That’s something I’m looking to do so a kiln is the next thing on my shopping list! Eco friendly metal of course! I use sheet and wire, though I’m especially enjoying working with wire right now. 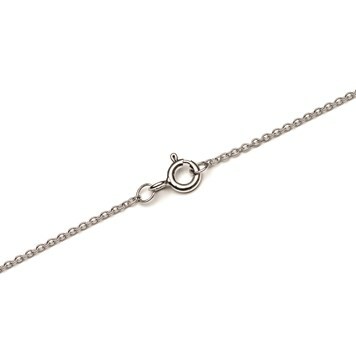 This delicate sterling silver fine trace chain is is what I pair with all my pendants. It’s so simple that it works with every design. 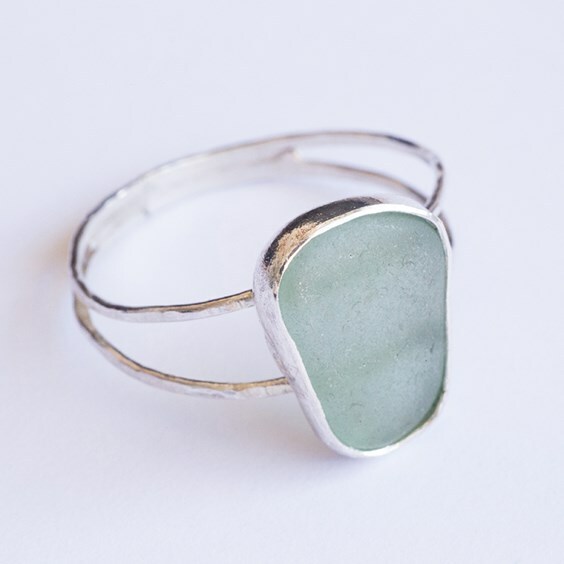 I use fine silver bezel strip to create settings for the sea glass. As this is fine silver it’s so soft and pliable for working around all the unique corners and bends to create a secure fitting for the sea glass so that I can then build it into a larger piece of jewellery. Filled with natural gemstones, eco friendly metal and charms all inspired by the beauty that nature brings.